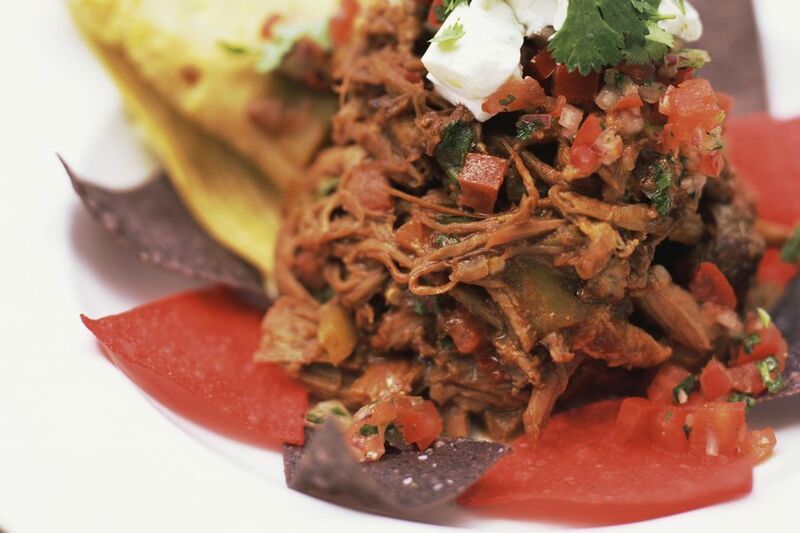 You can make delicious tamales filled with succulent slow-roasted shredded beef. Making tamales is easy once you get the hang of it. It may take you a little longer to make the first few, but after you learn the ropes, you'll have a whole batch ready in no time. Begin by preparing the beef filling. Heat a large saucepan or pot over medium-high heat and add in the cooking oil. Swirl it around to coat the bottom of the pan or pot. Sprinkle the flour over the roast and rub it in evenly over the surface. Carefully place the chuck roast into the hot pan and let it sizzle for 2 to 3 minutes or until it's browned nicely. The idea is not to cook it, but to sear the outside to seal in the juices. Turn the roast over and sear the other side. If the roast is thick enough, you can also brown the sides as well. Place the roast into a slow cooker. Use a spoon to smear the annatto paste over the top. One at a time, sprinkle on the ground cumin, chili powder, oregano, garlic, cocoa, and salt. Add a can of chopped green chiles. You can pour them right on top of the roast. Peel the onion, and chop it into 1/4 pieces or smaller. Add those in as well. Pour the water or beef broth into the bottom of the crockpot, it should come up to about an inch up the sides of the roast. You don't want the liquid to come up too high, or it will be soupy. Cook on low for 7 to 8 hours. After the time is up, the beef should be fork tender and fall apart easily. There should be barely any liquid in the bottom of the pot and what is left should be of a gravy consistency. Use two forks or a slotted spoon to remove any large chunks of fat from the roast. Shred the remaining beef by pulling it apart into chunks or strands. Mix the liquids and beef together until it is well combined. To prepare the corn husks, go through the corn husks removing any debris. Separate the larger usable pieces from the smaller bits and pieces. Save the smaller pieces for later. Place the husks into a large bowl. Cover the husks with warm water. Set a heavy item (like a heavy bowl or mug) on top of the husks to keep them submerged for 30 minutes or until soft. Remove the husks from the water and pat dry. Place into a covered dish or a large plastic bag to prevent from drying out. Use only the larger and medium-sized husks for the tamales. The smaller ones can be used later for ties or patches. When looking at the husk, notice the shape. They have a narrow end, a broad end, and two long sides. Prepare the masa harina tamale dough. In a mixing bowl combine masa and warm water or broth until combined. Let the mixture sit for 20 minutes or so to let the masa soften. Mix it on low speed until a dough forms. Gradually add the salt, cumin, and onion powder by sprinkling them over the dough as you mix it. In a separate bowl, whip lard or shortening about 3 minutes or until fluffy. Add the lard to the dough a little at a time while mixing until well combined. The mixture should be about the consistency of peanut butter. If not, add more masa harina, water, or broth as necessary. To assemble the tamales, lay a husk on a flat surface. Spoon 1 to 2 tablespoons of dough onto the husk, depending on the size of the husk. Use the back of a metal spoon to spread the dough onto the husk. When spreading the dough, leave a space of about 4 inches from the narrow end of the husk and about 2 inches from the other end. Spread the dough to the edge of one of the long sides and 2 inches away from the other long side. Try to keep the dough approximately 1/4 inch thick. Locate the long side with a 2-inch space with no masa. Fold that over, slightly overlapping the other side so the edges of the dough meet. Wrap the extra husk around the back. Then fold the broad end over the top and then the longer narrow end over the broad end. Create strips of husk by cutting or tearing 1/4 inch lengths off of some of the smaller or unusable husks. Use these to tie across the middle of the tamale to hold the flaps down. Steam for about 90 minutes and let them cool before serving.